El Corral de la Pacheca is a flamenco restaurant offering Spanish cuisine. The average price of a 3-course meal at the El Corral de la Pacheca restaurant is 70 euros. Note that although GoMadrid.com strives to maintain all information about El Corral de la Pacheca up to date, the prices mentioned are only an indication and may not reflect the exact value of your meal. Note that the above price includes dinner and professional flamenco show. 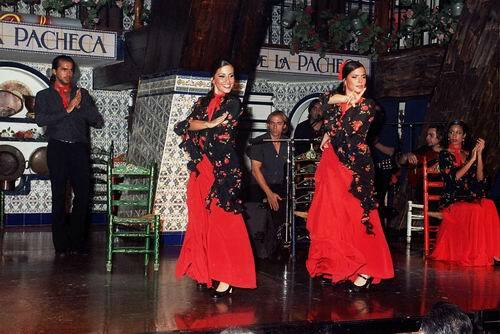 For nearly 30 years, Corral de la Pacheca has hosted flamenco shows. This company of dancers, singers, and guitarists is of the highest caliber. The club, which also serves dinner, has a warm, yet quite grand, ambience. The decor features ceramic floors and exquisite azulejo tile work. It's a fashionable locale which features flamenco performers who both sing and dance. Open daily from 9pm to 3am. - selection of cold meats made with acorn-fed pork (ham, sausage, spanish salami, pork loin). - selection of cured manchego cheeses. - terrine of duck foie gras with blackberry jam. - 'el corral' housemade croquettes with mixed lettuce. - piquillo peppers stuffed with shellfish. - fresh green navarra asparagus grilled with coarse salt. - smoked norwegian salmon with tartar sauce. - mixed grill of seasonable vegetables. - andalusian style mixed pan-fried fish. - salad made with boiled lobster from our hatchery. - tudela lettuce hearts with thin slices of tuna belly. - duck ham salad with foie gras and fresh vegetables. - grilled hake trunks with garnish. - san seared sole with essence of meuniere sauce. - sea bass with bilbaina sauce on a bed of sliced potatoes baked with julienned onion and roast peppers. - gilthead baked in coarse salt accompanied by garnish flavored with garlic mayonnaise. - galician lobster with fresh vegetables. - saffron-scented 'arroz caldoso': rice in broth with lobster from our hatchery (for two diners). - supreme of chicken to the oven with mushrooms of season. - barbecued fillet of fattened pork with wild mushroom puree. - grilled galician rib steak with spanish sauce. - suckling aranda lamb chops with garnish. - confit of duck with port and currants. - 'villagodio' - 1.2 kg. prime rib of beef with sliced potatoes baked with julienned onion and vegetables (for two diners). - selection of ice creams and sherbets with red fruits. - frozen truffle with mango puree. - housemade creme caramel with whipped cream and caramelized walnuts. - selection of seasonal fresh fruit. - natural sheep's milk junket with wildflower honey. - apple pie with raisins soaked in liquor. - mousse of catalonian creme brulee with caramel and sugar glazing. - pie of the week with seasonal products. The Corral de la Pacheca also offers a marvellous New Year's Gala menu, which may be seen here. The address of the El Corral de la Pacheca restaurant is: Calle Juan Ramón Jiménez 26, 28036 Madrid. The nearest Metro station is Cuzco. Please see the El Corral de la Pacheca restaurant location map below.